Jerome Lee, owner of the Magic Panda, a new Chinese restaurant in Prospect, suspiciously has a finger cut off. Three days later, he’s found hanging from a second floor landing in his home, a suicide note only a few feet away. But Police Chief Sam Jenkins thinks Mr. Lee was the victim of gangster Jimmy Fong, a thug employed by loan shark and triad leader Martin Kee. 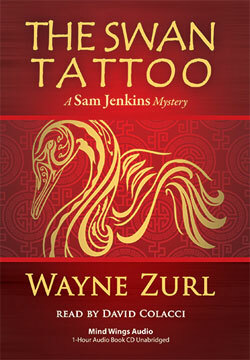 Sam’s investigation takes him to Atlanta, Malaysia, and back to Tennessee with twists and turns and false leads. At 12:30 Kate and I waited inside the doorway of the Magic Panda, a new Chinese restaurant in Prospect. Every table was occupied, five people stood in front of the sushi bar, and more than a dozen hungry souls circled the two long buffet islands like buzzards over a dead cow, each holding a large white plate. One heavyweight cracked his head on the glass canopy when he reached to the opposite side of the steam table and grabbed the last egg roll before a young girl could take it. Four soumo-size customers sitting at a table looked like they’d finished eating, but continued to shoot the bull, caring nothing for the local police chief and his wife who needed a seat. I hate when people do that and envisioned more steam escaping from my ears than what circulated beneath the buffet trays. If my wife wasn’t so good-looking, I’d have gotten mad at her. Then a bloodcurdling scream from the kitchen grabbed everyone’s attention. Being the only man of action in the building, I pulled out my badge and trotted toward the noise. “Call 9-1-1,” I said to Kate who followed me. We pushed through the double swinging doors and found a middle-aged man holding a bloody apron around his left hand. The color had drained from his face as quickly as his blood soaked the apron. When I got near the victim, I noticed a foot-long kitchen knife and a little finger lying on a wooden cutting board in the middle of a stainless steel table. “Someone hand me a clean towel or apron, quick,” I barked at the onlookers. The calmest man in the room, a thin young guy with a pony tail and brightly-colored sport shirt pulled a clean apron from a nearby shelf and handed it to me with as much emotion as a two-toed sloth. I rewrapped the hand, but in only moments the oozing blood soaked the white cloth. Pressing the veins on the underside of the man’s wrist helped, but not much. As Kate and I pushed through the kitchen, I grabbed a plastic bag and stuck his bundled up hand inside. As we hustled through the dining room, most of the customers gave us their undivided attention, but a resolute segment of the starving masses kept gobbling their pepper steak or gnawing on their chicken sticks. With Kate and my victim snuggling in the back seat, I fired up the Crown Vic, turned on the flashing grill lights, and flipped a switch for the siren. Once I hit the blacktop and nailed the accelerator, I grabbed the microphone. “10-4, Prospect-one. Five-zero-one is 10-36 now.” Bettye said calmly—she never gets rattled. I looked in the rearview mirror at the Asian man who was still moaning, mumbling, and gently rocking back and forth as Kate held his crudely bandaged hand. Kate and I stood in front of the triage area only a few feet from the entrance to the emergency room. Kate smiled and was about to tell me to shut up when the Chinese woman PO Junior Huskey brought to the hospital walked out of the ER. She looked pale and thin and wore her black hair pinned back with barrettes. I stepped over to meet her. “I am Agnes Lee. Someone from the restaurant called me at home. It was my husband Jerome who had the accident. We own the Magic Panda.” She spoke with a slight accent and appeared concerned, but not too upset. Her eyes flashed between Kate and me. She looked like I had just asked the sixty-four thousand dollar question and she didn’t know the answer. I thought about that and wondered how a right-handed man using a kitchen knife could slip and cut off his left pinkie. Why not the thumb or index finger? They’re closer. “What report? It was an accident.” She sounded surprised. She didn’t look happy with my answer. I found a scrap of paper in my jacket pocket and wrote down a pedigree on Jerome Lee. Agnes Lee mumbled something, turned, and walked a few yards to the waiting area. Kate and I left the building. “Notice anything odd back in the kitchen?” I asked. “They always play mahjongg for money,” she said. “Very observant, Inspector Charlie Chan.” Kate spoke with a theatrical Chinese accent. “Right, number one wife. Also, he would have to reach across hand to cut off pinkie when three other fingers and thumb were closer to blade.” Two can do Asian accents, doll-face. “What about my theory on access to the pinkie” I growled. I ignored her juvenile statement. Kate snapped her seatbelt in place and I switched on the ignition in the big Ford. “Are we going back to the Magic Panda?” she asked.